See You When the Light Turns Green! Shortly after my daughter moved to her big girl bed, she developed an early waking habit that we just couldn’t kick. After two-plus years in a crib, she hadn’t quite figured out that she could just get out of bed, thankfully. But she was a screamer and would call out in full voice, “Mommy…I want to wake up!” over and over. In addition to waking my husband and me, I was terrified she was going to wake our peacefully sleeping infant who was in the same room. So I needed to address this problem pronto! My cousin Liz, who has two little girls, suggested the Stoplight Sleep Enhancing Clock. I’ll admit it’s not the most attractive addition to our room. But it has had the greatest impact. The idea is simple—for kids who can’t tell time, the stoplight provides a clear and easy-to-understand guide for when it’s time to get up. There’s a small digital clock at the bottom. You set the alarm time at the back of the clock and when your child is ready for bed, you push the “Alarm” button on the front of the clock that illuminates the RED LIGHT. When the clock reaches the alarm time, the light switches from red to GREEN and your child knows he or she can get up! Since the red light is on all night, it also acts as a night-light. There is also an audible alarm, which you can choose to turn off or on. Obviously we turned ours OFF! While this clock is a great tool, you can’t just expect your kid to stay in bed until the green light the very first time. There’s a trick. Here’s how we used the clock to eliminate our early waking problem. When we first got the clock, we made a big deal about it. The first several nights, we set the alarm to switch on at the early time that our daughter had been waking. We celebrated when she waited until the green light each morning, even though it was still a full hour earlier than our desired wake time. After three or four days of “success” we pushed the alarm time later by about ten minutes. Again, we celebrated every success and sternly reminded her to wait for the green light on the days she didn’t make it. A couple of times, we ignored her screaming until we knew the light had switched and then we just pretended that all was well and it was time to get up. After another three days of success we pushed the alarm time later by another ten or fifteen minutes. Within two weeks, our daughter was waking at our desired time when the light turned green. 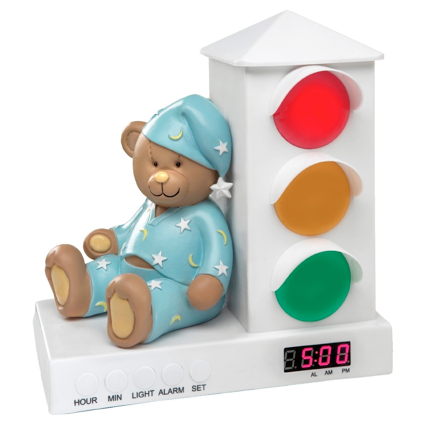 We’ve been using the stoplight alarm clock ever since and continue to have good results. Some of you have asked me how to set or change the time on your clock. Here are the instructions for setting and using the clock. Good luck!